Lee Pomeroy, 51, was knifed to death on a London-bound train after boarding at Guildford but the suspect managed to flee at Clandon station . Lee’s 14-year-old son sat with his dying father on the platform. The Surrey train stabbing suspect gave police the slip when his lover picked him up in her car as he fled the scene, according to reports. The suspected attacker left the London-bound train at Clandon station and was able to evade police, sparking a huge manhunt. Lee Pomeroy, 51, was stabbed to death in front of his son the day before his 52nd birthday. 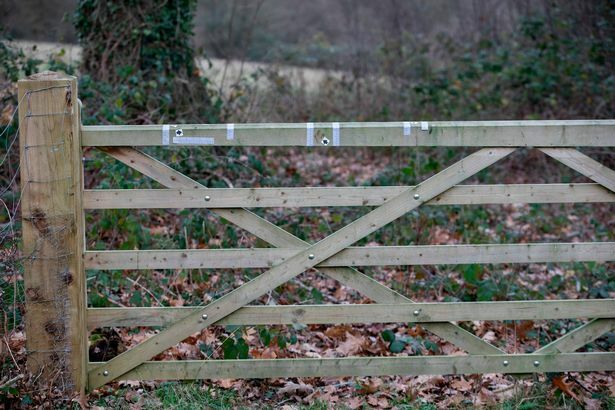 The suspect is believed to have left a trail of the victim’s blood as he fled with a gate near Clandon station having blood smears on it. He is also said to have dropped a bloodied hat in nearby woods. Father and son were on a day trip to central London at lunchtime on Friday which turned into a tragedy. Sources told The Sun that dad Lee and the attacker had a row lasting several minutes on the Surrey to London Waterloo service before the suspect pulled out a knife and slashed Lee. The suspect got off at the next stop, Clandon, and then called a female friend on his phone, according to the newspaper. It is reported that the suspect was then picked up in a car on the edge of the village. British Transport Police raided an address in Farnham, 15 miles away, on Saturday morning and arrested a 35-year-old man on suspicion of murder and a 27-year-old woman on suspicion of assisting an offender. A blue Vauxhall Corsa car was forensically examined by cops outside the property. This morning detectives were granted an extra 12 hours to question the pair. Lee, who lived with wife Svetlana and their son in a house in Guildford, was due to have celebrated his 52nd birthday on Saturday. After the attack police with dogs scoured the countryside around Clandon and a helicopter was scrambled in the hunt for the knifeman. The Sun reports the breakthrough occurred when footage from CCTV was examined and showed a car turning up in the area within a short time of the killing. Cops have also obtained video of Lee with his son getting on the train at Guildford’s London Road station. Further CCTV images have also been obtained showing the confrontation between Lee and his killer on board the train. British Transport Police’s Detective Chief Inspector Sam Blackburn said: “In the moments leading to the violent killing, both men appeared to be involved in an altercation lasting three minutes. A witness has reportedly described frantically trying to save Lee’s life after arriving at Horsley station to catch a train. Lee had been moved to the platform and the man, who asked not to be named, told The Sun Lee was conscious when the train arrived at Horsley. He added: “A British Transport Police officer arrived and was talking to him but he stopped breathing so I ran to get a defibrillator. “When I came back, I put that on his chest while the officer did CPR and then the paramedics arrived after about five minutes and took over. Det Chief Insp Blackburn said police still wanted to hear from anyone who was on the 12.58 service from Guildford to Waterloo.